If you are frustrated that your dog keep’s destroying your yard, then artificial grass for dogs will give you back your lawn and your sanity. It does not matter how many dogs you have or their size, ProGreen’s Pet Turf is the perfect artificial grass that can withstand the wear and tear of their constant running, jumping and trying to dig all over your yard. Plus, after a good snow or rain storm it will eliminate any issues with mud and puddles. The most important feature to look for is how well it will drain in your yard. That is where Progreen’s Artificial Turf will more than exceed your needs and expectations. All of their Artificial Grass for Dogs products have our patent-pending ProFlow technology, which is a non-perforated backing that is designed to increase drainage capacity by over 100%. While most perforated synthetic turf that is used by other companies contain infill, sand and other particles that can easily clog the holes over time, Progreen’s ProFlow has a fully permeable backing that will remain reliable throughout the life of the artificial turf. Whenever we do an install it includes an under-drain system that works with ProGreen’s grass’ ProFlow backing. This high drainage capacity system will not only drain quickly, it also rids you of any potential mud problems, which will put a smile on your face because there will longer be the days of muddy dogs and paws all over the inside your house! 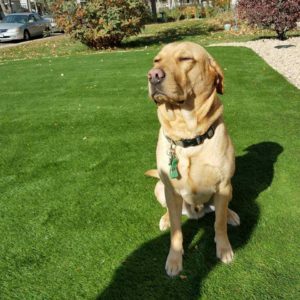 So if you are looking for the right Artificial Grass for Dogs for your backyard, dog run, kennel, daycare facilities, dog agility courses, and more. 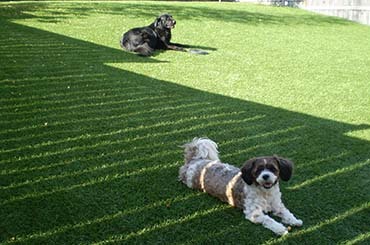 Progreen’s Artificial K9 Pet Turf will be the right solution for you. If you would like to get a quote on having us install an Artificial Grass area in your yard, for your kids and/or dogs, Please Click Here or call us directly at (303) 829-3374.